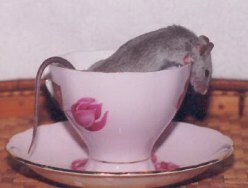 Miss Tundra, ever the lady, didn't just leap to freedom like everyone else--she got put in a cup, and in the cup she would stay, although it didn't stop her from wondering why she was in a cup. Miss Tundra was part of Hickory's first harem, along with Spot, Smudgie, Peaches and Sneaky Mushpie. Until her death, Tundra and Hickie were inseperable--they were...well...in love. Sometimes she would happily join Smudge in her shenanigans, or hang out with Spot, but most of her time was spent with Hickory. Peaches and Mushpie moved out after a while, however, as Tundra took a dislike to Peaches. Hickory was always there when Tundra would chase Peach, and put an immediate stop to it by getting between them. I decided it would be easier on everyone if Peaches left. Sneaky Mushpie went along with her as company. Mushpie got along with everybody. Even "Lady" Tundra. Tundra was definitely a Lady, and it just seemed necessary to add the "Miss." She was always very dainty and genteel, except for the problem with Peaches. And she was gorgeous.